‘Matsue Castle’, designated as an important cultural asset, is one of the largest and oldest castles among the existing castles in Japan. In the last days of the Edo period, at the beginning of the 19th century, the number of castles with a full-scale donjon what is called ‘tenshukaku’ was about 70 across Japan. Unfortunately, many of them were intentionally destroyed when Japan’s modernization was ongoing, and were reduced to ashes during the second World War. Only 12 original tenshukakus have survived this tragic drama. 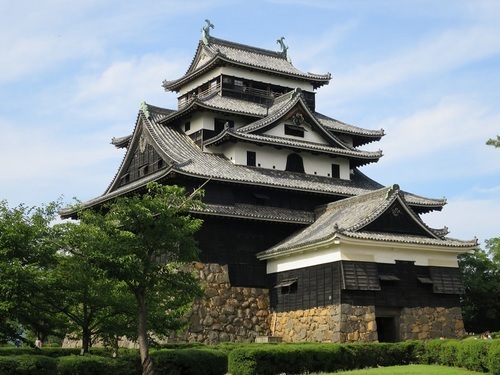 Matsue Castle in the picture, which is one of thhe survivors, boasts the great tenshukaku with the second largest total floor area as well as the third tallest height of 30 meters. The construction work of this castle was started in 1611 to be completed in 1616. This tenshukaku was designed to be used as a fortress in case of emergency, with little decoration, since the days of the construction work were not enough pacified. The observatory on the top to watch the enemy has no walls to get a 360-degree view. JAPANESE PROVERB, “Jigoku de hotoke ni atta yo u” “Jigoku no sata mo kane shidai” ETC..